Product #60596 | SKU HDD-1015 | 0.0 (no ratings yet) Thanks for your rating! The HDD-1015 High-Speed HDMI to Micro-HDMI Cable with Ethernet from Pearstone allows you to connect your portable devices to HDMI displays. Transfer movies, photos, and videos from devices like cell phones, digital cameras, and video cameras to view on your HDMI display. This cable supports supports Audio Return Channel, 3D content, and a resolution of of up to UHD 4K (2160p). 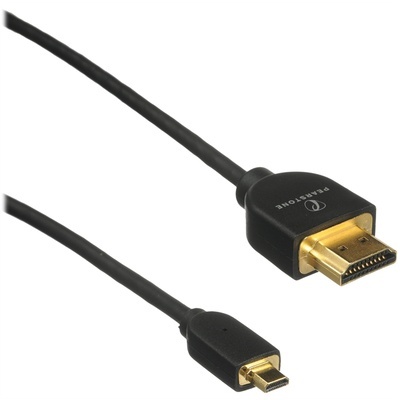 HDMI Ethernet Channel technology consolidates video, audio, and data streams into a single HDMI cable.